Identification. Palestine is the name the Romans gave in the second century C.E. to a region of the present-day Middle East situated on the eastern shore of the Mediterranean Sea west of Jordan. The name is derived from the Greek Palaestina, or "Land of the Philistines," a seafaring people who settled a small coastal area northeast of Egypt, near present-day Gaza, around the twelfth century B.C.E. Also known as the Holy Land, Palestine is held sacred by Christians, Jews, and Muslims, some of the most important events in each religion having taken place there, especially in the city of Jerusalem. Location and Geography. Palestine's geographical area has varied greatly over the centuries, as the land was conquered repeatedly by the great empires that came to power in the Mediterranean and the Middle East. Israel, the West Bank and the Gaza Strip, and parts of Egypt, Jordan, and Syria were once part of Palestine. The Gaza Strip is a narrow sliver of land about eighteen miles long (twenty-nine kilometers)and five miles wide (eight kilometers) on the Mediterranean Sea between Egypt and Israel. It is mostly flat and sandy, with little fertile soil. The West Bank is about ninety miles long (one-hundred-forty-five kilometers) and thirty miles wide (forty-eight kilometers) and is surrounded on all sides by Israel except to the east, where it abuts the Jordan River and the Dead Sea. The West Bank is fertile in the north and mostly barren in the south. Demography. The estimated 2000 population of Gaza was 1,132,063, approximately 99.5 percent of whom were Palestinian Arab. The West Bank estimate was 2,020,298, with approximately 83 percent Palestinian Arab and 17 percent Jewish. 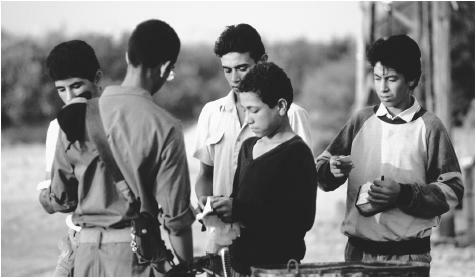 About half of the population of the West Bank is under age fifteen. Linguistic Affiliation. Like the Jews, the Palestinians are a Semitic people, and the languages of the two groups are similar. Palestinians speak primarily Arabic and Jews speak a Hebrew derived from that of the Bible. The two languages have some of the same words and sound similar to people unfamiliar with the languages. Symbolism. The Palestinian flag, consisting of three bands of (top to bottom) black, white, and green with a red triangle on the flagstaff side pointing to the center of the white band, is a symbol of Arab unity. Another popular symbol in Palestine and the rest of the Arab world is the eagle of Saladin, named for a twelfth-century warrior who united Arabs to defend Islamic territories against the Crusaders. It was depicted on Egypt's 1954 Liberation Flag, which was a variation of the Arab Revolt Flag of 1917. Emergence of the Nation. Because of its location at the crossroads of Africa, Asia, and Europe, Palestine has been the battleground of the great powers in the region throughout its history. Conquerors of the region included Egypt, Assyria, Macedonia, Rome, Byzantium, Arabia, and Turkey. Settlement in the area is believed to date back to about 8000 B.C.E. , to the village of Jericho in the West Bank. By about 1000 B.C.E. the Hebrews had established the kingdom of Israel, which later split into two kingdoms, Judah and Israel. The area later changed hands among Assyrians, Babylonians, and Greeks. In the first century B.C.E. the Romans conquered the region and drove out most of the Jews. Palestinians are descended from these Arabs. Except for brief periods during the Crusades, Palestine remained in Muslim hands almost continuously, becoming part of the Ottoman Empire in the sixteenth century. With the World War I (1914-1918) defeat of the Ottoman Empire, Britain was mandated by the League of Nations to govern Palestine. During the war, both Jews and Arabs had been given conflicting assurances regarding control of Palestine. The British had given their support for Arab control over a region that the Arabs believed included Palestine. Britain had also pledged to support a Jewish homeland in Palestine, however. Also, during the late nineteenth century, Jewish immigrants had been returning to Palestine in increasing numbers as they fled European and Russian persecution and sought to return to their homeland. Jewish immigration steadily increased after World War I, increasing tensions between the Jews and the Arabs and often resulting in violence. With the coming of World War II and the Holocaust, there was a surge in Jewish immigration, exacerbating the problem and forcing Britain to relinquish its mandate and turn the problem over to the United Nations in 1947. That same year, the UN voted to partition Palestine into separate Arab and Jewish states, a plan the Arabs did not accept because they wanted all of the territory. The Jews did accept the proposal. Naming their state Israel, they declared its independence on 15 May 1948. Five Arab armies immediately attacked Israel. After the war, the West Bank was controlled by Jordan, and the Gaza Strip came under Egyptian rule, but Israel controlled the rest of Palestine. More than half a million Palestinians were displaced from their homes during the turmoil, many fleeing to the West Bank, the Gaza Strip, and other Arab countries. Nineteen forty-eight thus marks the beginning of an ongoing struggle to build a Palestinian nation, as those displaced by the war have since that time agitated to return to a Palestinian homeland. The Palestine Liberation Organization (PLO), formed in 1964 under Egyptian leadership and led by Palestinian politician Yasser Arafat beginning in 1969, emerged as the main voice of the Palestinian people. Israel and its Arab neighbors have endured many wars since 1948. In the 1967 Six Day War, Israel captured the West Bank and the Gaza Strip, among other areas. The West Bank and the Gaza Strip are often called the Occupied Territories, and most of the residents are Palestinian Arabs. Many have been refugees in the Occupied Territories since the 1948 war. Israel also annexed East Jerusalem, a revered holy site of Jews, Muslims, and Christians, in 1967. Another major milestone on the road to statehood was reached in December 1987 when a traffic accident in the Gaza Strip sparked the intifada, an often violent, twenty-year-long campaign of civil disobedience and nationalism in which militant Palestinians vowed to extinguish Israel and the Israelis. The PLO used this time of turmoil to engage in negotiations in which it renounced terrorism, recognized Israel's right to exist, and proposed the creation of a Palestinian state. The intifada intensified peace talks, and in 1993 Arafat and Israeli prime minister Yitzhak Rabin signed a historic peace accord calling for eventual Palestinian self-rule in the Gaza Strip and the West Bank town of Jericho. The Palestinian National Authority (PNA), a new governing body created to assist in self-rule for Palestinians in Gaza and the West Bank, began administering these areas in 1994, achieving yet another breakthrough in the creation of a Palestinian state. Palestinians in Gaza and the West Bank reached another milestone in 1996 when Israel withdrew its troops from most of the area and they elected Arafat as president of the Palestinian National Authority. Ethnic Relations. The modern-day conflict between Israel and the Palestinians dates back to World War I and the conflicting promises to Arabs and Jews regarding a homeland in Palestine. The years since the war have been marked by enmity, violence, and terrorism as each group seeks to assert its claim to a Palestinian homeland. After decades of violence between the two factions—and decades of international attempts to bring stability and normalcy to the region—peace seemed no closer at hand in the early days of the twenty-first century. Amid ongoing peace talks, fierce violence erupted in October 2000, claiming more than three hundred lives and leaving thousands wounded. Thousands of Palestinians in the West Bank and the Gaza Strip live in refugee camps that have gradually become permanent settlements, while many others live in comfortable homes in modern towns. In a traditional village, one-story houses made of white stone predominate. They usually have a kitchen, a sitting room, bathing room, and small bedrooms. Many homes have gardens and are surrounded by a high wall with a gate. Wealthier families sometimes have two-story homes, the top used for living quarters and entertaining, the bottom for utilities and storage. Some homes have indoor plumbing and electricity. The crowded refugee camps are equipped with small cement-block huts with corrugated metal doors and roofing. Food is prepared on a metal grate placed over a container of charcoal. Thin mats placed on the floor serve as beds. People bathe and wash clothes in metal drums filled with water from a community well. Food in Daily Life. Palestinians often buy snacks or light meals from street vendors as they go about their daily business. It is customary to eat the main meal between two and three o'clock in the afternoon. Many dine on falafel, sandwiches made with balls of deep-fried hummus, or grilled lamb sandwiches, called shwarma . Pita bread is usually a part of every meal. Other popular dishes include lamb, eggplant, chicken, and rice. Also popular are pastries, usually made with honey and almonds or pistachios. Drinking coffee or tea is a major social activity for Palestinian men, and conversations and business deals often end with several cups. Food Customs at Ceremonial Occasions. A favorite dish served at weddings, feasts, and funerals is mensaf, a large platter of rice covered with a rich lamb or goat stew and pine nuts. Basic Economy. The Palestinian economy is based almost completely on agriculture, with livestock, fishing, and some small industry making a smaller contribution. Palestinians depend on Israel for about 90 percent of their external trade. The West Bank is largely a region of small villages where agriculture is the mainstay of the economy. The chief crop is olives, which are produced on about half of the cultivated land. Other important crops are grains, fruits, and vegetables. Agriculture also dominates the economy of the Gaza Strip, the main crops being citrus fruits and vegetables. Both the West Bank and Gaza are heavily dependent on Israel and oil-producing Arab states for jobs. Forty percent of Gazans commute to jobs in Israel, earning more than one-third of Gaza's gross national product. After the Israeli occupation in 1967, the West Bank became heavily dependent on service-sector jobs generated by the strong Israeli economy, and Palestinians came to dominate the construction industry in Israel. 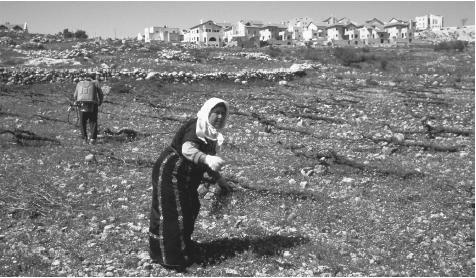 Palestinians farming land near Efrata, West Bank. Agruculture is the foundation of the Palestinian economy, especially in the northern part of the West Bank. increased in recent years. The Palestinians went on frequent strikes and Israel barred them from the country, hiring workers from other countries to replace them. The Palestinians also lost another major source of income when many lost their jobs in Arab oil nations because they supported Iraq in the Persian Gulf War in 1991. High unemployment plagues both Gaza and the West Bank. Palestinians are hoping the new Gaza International Airport, opened in 1998, will boost the economy. Produce can now be shipped directly to Europe rather than having to go through Israel first. Also, in the late 1990s foreign investment began flowing into new industrial zones in an attempt to create more jobs within the Occupied Territories. Major Industries. The West Bank supports a few small industries, including textiles, food processing, cement manufacturing, and the manufacture of toys, furniture, clothing, and shoes. Trade. Since the Israeli occupation of the West Bank and the Gaza Strip in 1967, the Palestinian economy has become very dependent on Israel's, especially for jobs and as a market for agricultural products. Most of Palestine's exports—consisting of fruits, vegetables, and cooking oil—are exported to Israel. Classes and Castes. For the most part, Jewish Israeli settlements in the West Bank are separated from Palestinian communities. Most of the best roads, shopping facilities, jobs, and services are found in the Israeli areas, and Palestinians resent this. Adding to the frustration and anger of ordinary Palestinians is the fairly recent emergence of two distinct cultures within the Palestinian community. At one extreme are the Palestinians who were educated in private schools and often lived in the United States or Europe before their parents returned to their homeland in Palestine, many after the 1993 Oslo accords, carrying their children with them. Many of the returnees get the best jobs through social or political connections, and many flaunt their money and automobiles. At the other extreme are the majority of Palestinians, those who have lived in Palestine throughout the Israeli occupation and who spend their days doing menial chores in poverty. 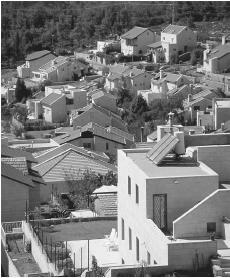 Haradar settlement on the West Bank. connections, they can easily move freely in and out of the Palestinian territories, an extremely difficult proposition for the poor. To many, the gulf between rich and poor may pose a bigger problem than achieving the goals sought in negotiating the final sovereignty status of the territories. Government. In 1993 Israel and the PLO, in their first direct talks, signed a historic agreement calling for limited Palestinian autonomy in Gaza Strip and Jericho in the West Bank as a first step to Palestinian sovereignty in the Occupied Territories. The Palestinian National Authority (PNA) was set up as an instrument of Palestinian interim self-rule. By early 1996, most of the rest of the West Bank had come under Palestinian administration. The PNA includes the eighty-eight-member Palestinian Legislative Council, an elected body, and Yasser Arafat, elected president in 1996. There is also a twenty-member cabinet appointed by the president. At the beginning of 2001, however, Arafat alone was the de facto "government" of the Occupied Territories. The PNA has set up a judicial system. It is also responsible for local government, education, commerce, industry, agriculture, labor, health, taxation, and tourism, among other matters. Leadership and Political Officials. The leading figure in the Palestinian fight for statehood has been Yasser Arafat. At the beginning of 2001, he was the chairman of the Executive Committee of the PLO, the president of the Palestinian Authority, and the head of the Central Committee of Fatah, the major political faction within the PLO. Social Problems and Control. The biggest problem for the Palestinians at the beginning of the twenty-first century was the ongoing struggle for a homeland in Palestine and the right to self-determination. Unemployment and poverty are also huge problems. Many young Palestinians—who constitute a majority of the population of Gaza and the West Bank—have never experienced life outside a refugee camp. Their lives have been shaped by conflict and violence, rampant unemployment, and continual unrest. With ongoing violence continually shattering hard-won peace accords, however, a Palestinian state—and peace and stability in the Middle East—still seemed elusive at the beginning of the twenty-first century. Military Activity. Established in May 1994, the Palestinian Police Force includes the Palestinian National Security Force, the Palestinian civil police, the civil defense force, the Preventive Security Force, and the General Intelligence Service. Quasi-military security organizations include the coast guard and military intelligence. The Palestinians receive substantial international aid, and the United Nations Relief and Works Agency (UNRWA) handles most of the needs of the refugees, about half a million of whom still live in camps. In addition to health centers and hospitals, which provide free basic health care, the UNRWA supplies educational and social services, as well as money for the unemployed needy. The UNRWA also supports special groups such as people with disabilities and the elderly. Division of Labor by Gender. Many Palestinian men consider it unacceptable for women to work outside the home, so women are usually restricted to homemaking or local cottage industries. They also frown on women wearing Western-style dress, preferring them to dress in the traditional Muslim jilbab, a long jacketlike dress, with a scarf to cover their hair. The Relative Status of Women and Men. As in other Arab cultures, men are at the center of Palestinian life. The family patriarch makes all decisions regarding living arrangements, children's marriages, and money. Obedience to one's father or husband is one of the highest indicators of honor in an Arab woman's life. Marriage. Although polygamy is a common practice among Arab men, with as many as four wives allowed, most Palestinian men have only one or two wives. Traditionally, when a man and woman wish to marry, the man approaches the woman's family as a prospective husband. After declaring their engagement, the couple and their families get to know one another before the wedding. In urban areas and among university students, couples may marry without the older family traditions. A wedding calls for a big celebration, with singing, dancing, and feasting. The couple exchanges vows in a simple Muslim ceremony called the Katb al-Kitab. Domestic Unit. Extended families tend to live together in the same household. It is unusual for young people to have their own place before they marry and have children. Frequently, married children also live with their parents. Elderly parents are nearly always cared for at home by the families of their children. If a man has more than one wife and can afford a large house, each wife gets a separate set of rooms. More often, the houses are small and afford little privacy. Kin Groups. Family clans dominated by the patriarchs of each group once played a major role in Palestinian society, but these were based on land ownership that no longer exists, so clans have lost their importance. The extended family remains, however, as the strongest social unit. Infant Care. A people with one of the world's highest birth rates, the Palestinians care for their children with pride. An infant boy's circumcision is an occasion for celebration. Extended families help in caring for infants and young children. Child Rearing and Education. Because about half of the Palestinian population is under age fifteen, education is a prime concern. The school system in Gaza is based on Egypt's and the West Bank's system is based on Jordan's, and there are numerous literacy and cultural centers at all learning levels. Schools vary, but most children get a free public education, from kindergarten through high school. Children from well-to-do families may attend an Islamic or a Christian school. Higher Education. Obtaining a university degree is a high priority for Palestinians. Palestine boasts eight universities and four colleges, all of which grant bachelor's degrees in arts and sciences. A few also offer graduate programs, and Al-Najah University awards a doctorate degree in chemistry. Palestinian men shake hands on meeting, and women kiss one another on the cheeks. Palestinians are friendly and hospitable, and neighbors pay one another frequent short visits at which coffee, tea, and sweets are shared. It is considered polite to turn down a dinner invitation to avoid imposing, but the host will continue to insist on the guest's company. Proper dress is essential in displaying good manners. Both men and women cover their heads, and women must always cover their shoulders and upper arms. Religious Beliefs. Muslims are the predominant religious group in Palestine, comprising around three quarters of the population, and Islamic practices prevail in the territories. Most Palestinian Muslims belong to the Sunni sect. The word Islam means "submission," to the will of Allah (God) and obedience to his commands. Muslims believe that the prophet Muhammad (c. 570-632 C.E. ) received Allah's commands from the angel Gabriel and that these revelations are recorded in the Koran (or Quran), the Islamic holy book. The Koran sets forth rules for everyday behavior as well as religious doctrine. Islam is inseparable from dayto-day life, so religion, politics, and culture are all bound together in Muslim communities. Religious Practitioners. An imam (spiritual leader) delivers the weekly sermon at a mosque. An official inspects magnetic identifications at the checkpoint between the Gaza Strip and Israel. Conflict between Israelis and Palestinians has resulted in decades of violence and created a need for tight security. Islam has no priests, and the imam usually has a full-time job in the secular world. Rituals and Holy Places. Devout Muslims pray five times a day, bowing toward the city of Mecca in Saudi Arabia, the birthplace of Muhammad. They are summoned to prayer by the call of a muezzin (crier) issuing from the minarets of the many mosques that dot the Palestinian skyline. Daily prayer is one of the "five pillars of Islam." The other four are the testimony of faith ("there is no God but Allah, and Muhammad is Allah's messenger"), giving to the poor, making at least one hajj (pilgrimage) to Mecca, and fasting during Ramadan and other religious holidays. Palestine contains many sites that are holy to Muslims (as well as many that are holy to Christians and Jews, hence much of the religious conflict in the region). The most revered to Muslims are the Dome of the Rock and al-Aqsa mosques, built in Jerusalem on the site at which Muhammad is believed to have ascended to heaven on a night's journey known as al-Isra' wa al-Mi raj . Death and the Afterlife. Palestinians observe a three-day mourning period when someone dies. Family and friends offer condolences and recite the Koran. Neighbors serve meals to the deceased's family and their guests throughout the three-day period. The deceased's death is observed again at the forty-day anniversary. Medicine and Health Care. In the West Bank, with its vast refugee population of more than half a million, the United Nations Relief and Works Agency provides health, educational, and social services. More than thirty health centers and hospitals provide free basic health care. Special services are also provided for the elderly and people with disabilities. Literature. Like most Arabs, Palestinians regard verse more highly than prose. The work of the highly esteemed poet and writer Mahmoud Darwish, like that of many Palestinian writers and artists, is highly political and deals with the Israeli occupation and the plight of the Palestinians. Darwish's "Identity Card," which graphically paints the Palestinians' dilemma, is one of the best-known works by a Palestinian. Darwish's work has been translated into the major languages. He also composed Palestine's Declaration of Independence. In The Wind-Driven Reed and Other Poems, Fouzi al-Asmar evokes the Palestinian longing for a homeland. Palestinian-Israeli writer Emile Habibi, a longtime representative in the Israeli Knesset, began writing in response to a leading Israeli politician's statements that the Palestinians did not exist; otherwise, they would have produced their own literature. Habibi went on to write a series of short stories and novels, one of which was translated into sixteen languages. Many Palestinian writers and artists live outside Palestine as émigrés. Palestinian-American Edward Said is a well-known historian and essayist. Said's Peace and Its Discontents and other books explore Palestinians' problems and aspirations. Other highly regarded émigré writers include Liana Badr and Hassan al-Kanafani. One of the greatest Palestinian fiction writers is Ghassan Kanafani, whose short stories in All That Remains: Palestine's Children depicts the aimlessness and desperation of Palestinian refugees. The works of many leading Palestinian writers are translated in Salma Khadra Jayyusi's Modern Palestinian Literature. Graphic Arts. Because Islam forbids the portrayal of people and animals, most Arab designs feature plants, leaves, or geometric shapes. Many Palestinians are skilled in calligraphy and illustrate verses from the Koran in beautiful designs and sell them at art shows. In larger tourist cities such as Jerusalem, Bethlehem, and Ramallah, craftsmen sell woven rugs and tapestries, leather goods, pottery, and ceramic jars. Also available are crafts made from olive wood and ivory: jewelry boxes, scenes of the Last Supper, crosses, camels, and mosques. Aburish, Said. Cry Palestine: Inside the West Bank, 1991. Ciment, James. Palestine/Israel: The Long Conflict, 1997. Gall, Timothy L., ed. Worldmark Encyclopedia of Cultures and Daily Life, vol. 3, 1997, s.v. "Palestinians." Gerner, Deborah. One Land, Two Peoples: The Conquest over Palestine, 1991. Gluck, Sherna Berger. An American Feminist in Palestine: The Intifada Years, 1994. Grossman, David. Sleeping on a Wire: Conversations with Palestinians in Israel, 1993. Hellander, Paul, Andrew Humphreys, and Neil Tilbury. Israel & the Palestinian Territories, 1999. Khalidi, Walid. Palestine Reborn, 1992. Kimmerling, Baruch, and Joel Migdal. Palestinians: The Making of a People, 1994. Lughod, Abu. "Palestinian Higher Education." Boundary 2, Spring 2000, pp. 80–95. Oz, Amos. Israel, Palestine and Peace: Essays, 1995. Said, Edward. The Politics of Dispossession: The Struggle for Palestinian Self-Determination, 1969–1994, 1994. Shipler, David. Arab and Jew: Wounded Spirits in a Promised Land, 1986. Stefoff, Rebecca. West Bank/Gaza Strip, 1999. Szulc, Tad. "Who Are the Palestinians?" National Geographic, June 1992, pp. 84–113. great reference! well done... it's real.. simple and easy to understand. thanks for the great info! gave a great outline for the understanding of the conflict and the roots behind it! kudos! nice writing there, i understand everything in there. very nice, masyaAllah. great information. i find it very helpful in my research. thank god, in a form of language that i can actually understand. THE REPORT PROVIDES USEFUL INSIGHT ABOUT DAILY LIFE, THE IMPACT OF HISTORY ON THE CULTURE; THE STRUGGLE FOR THE CULTURE TO STAY STRONG AND TO GROW IN TURMOIL; THIS IS USEFUL AS I PREPARE POLITICAL ASYLUM CLAIMS FOR YOUNG PALESTINAIN MEN. Its good to see ballanced perspective . Thank you! I was just wondering what type of clothing they wear? Thanks,I enjoyed reading this information,Beautiful culture!! Good to know. I really like this site. This website is great for searching and learning things too. Thank you for the amazing information! Cool Website and it helped me a lot for project ! !his is a really good website !!! It has Geography and culture and different kinds of things !!! Thank you for this information. We are two New Zealanders who wanted to find out why there are problems so we did an internet search and your information came up. This has enlightened us and now we can understand the situation better. At present we are teaching in an Arab country and it has been a precious experience living among Musulim people. Understanding breaks down barriers and builds bridges. It is important to listen to one another and show respect for differences. Thank you for helping us to do this. Very informative compilation. Much appreciated. To restore dignity of the poor Palestinians, Palestinians should encourage Small Industries and promote indigenously produced goods. Arab world can surely provide financial support to achieve this. Thank you for the information, it was very useful. Saladin is the Western writing, it should be Salah ah-Din. Hello, after reading your article I say it was compiled well for the most part but there are a couple issues I think you should primarily address. You seem to refer to the term Palestinians as Synonymous with the term Arab/Muslim throughout the article which should be adjusted. For example, you state that polygamy is common among Arab men, when in reality Polygamy is only practiced among the Muslim population of Palestinians. Although Palestinians are an Arabized people, like the Lebanese, Syrians, and Jordanians, they are linguistically and culturally Arab in the modern day but retain a distinct ethnic identity that is not Arabian. You refer to Palestinians being descendant from Islamic Arabs who came north from Arabia during the Islamic conquest, but you fail to mention how Palestine was a Christian state of Byzantium and before that a Roman state, it was not until the Islamic conquest where the majority of Palestinians began speaking Arabic as their primary first language. AWSOME ! !website!It helped me alot for this project i am doing at school! i love this country . the poeple of this country is very nice . I may be moving to the Palestinian territory soon to receive my new job. As a westerner, can anyone provide me with leads on Expats forums for westerners in that area? I googled the net on forums in the West Bank and the Gaza Strip, unfortunately, didn’t come back with much. Your help is greatly appreciated. This is a very nice, detailed exposition. It is hard to find good information about Palestine. Are palestinians allowed to marry christians. Coz I am falling in love to one. I AM IMPRESSED, GOOD INFORMATION YOU GUYS IT SAYS EVERYTHING THAT I NEED FOR MY REASERCH PAPER. COOL INFORMATION I JUST WANT TO KNOW MORE ABOUT THE EDUCATION THAT PALESTINIANS HAVE. Very well documented.. Easy to understand though i have read "Oh Jerusalem" long time ago.. From Assam India. A Palestinian from the West Bank here. There's a lot of dated info here (for example the education system following Egypt and Jordan- that started gradually changing when the Palestinian Authority was established in the 1990's) and also a very generalized perhaps even orientalist read of the Palestinians society (family patriarch makes all the decisions in the family .. hmm ya maybe during my grandmother's time although judging by her character I doubt that too hehe.. gender equality is still a struggle but things are certainly not as bleak or monolithic), this is just to give couple of examples. I just wanted to point that out for people who are genuinely interested to look beyond this one source.